“They don’t make ‘em like they used to,” is an apt description for director/co-writer René Laloux’s hallucinatory odyssey, Fantastic Planet. The groovy late-60s – early-70s aesthetic of the French-Czechoslovakian co-production* is a stark contrast to the hyper-real and cutesy animations that dominate the landscape of many modern domestic animated efforts. For his first feature film, Laloux chose a decidedly surrealistic direction, painting a convincing alien landscape that’s part nightmare, part dream. * Production of Fantastic Planet began in 1967, but was delayed due to the USSR’s subsequent invasion of Czechoslovakia in 1968. The project eventually resumed a few years later, culminating in the film’s eventual release in 1973. The story takes place on the home world of the Traags (or alternately, “Draags”), an advanced race of giant humanoids. The adult Traags spend most of their time meditating, while their children keep humans (referred to as “Oms”) as pets. We follow a young Om named Terr, as he journeys from slavery to freedom. After a group of careless Traag children kill his mother, the infant Terr is adopted by Tiwa, a young female Traag. She cares for Terr, but keeps him on a short electronic leash to prevent his escape. He inadvertently begins to learn at an exponential rate, thanks to a headset device that Tiwa wears during her learning sessions. Before long, Tiwa’s parents forbid her from bringing Terr along on the sessions, but his path to enlightenment has already begun and the Traag’s stranglehold on the Om population is about to come to an end. While the Traags regard individual Oms as a novelty, they consider the greater population of wild Oms that roam the planet an infestation. The Traags’ attempts to control their numbers occur with increasing frequency, an act of genocide against a species they don’t understand. In one scene, a Traag council meeting, we catch a glimpse into the history of the Oms, and how they ended up on the Traag home world. By the time the Traags arrived on Earth, human civilization had crumbled, and devolved into a feral state. Although humanity has been reduced to its primitive roots, one of the Traag elders observes that the Om “may well surprise us one day.” Indeed, it’s the Traag’s arrogance that is their undoing, as revealed in one scene (echoing Gulliver’s Travels), when the diminutive Oms attack and overcome their massive oppressor. During his formative years Laloux worked in a psychiatric hospital,* which influenced his artistic sensibilities and tendency to view things from a skewed perspective. Using designs by artist Roland Topor, he paints a psychedelic landscape where strange beasts roam and hidden dangers abound for the Oms. Fantastic Planet’s distinctive style falls somewhere between the psychedelic imagery of Yellow Submarine and Terry Gilliam’s Monty Python animations. It may appear jarring to modern eyes (the animation isn’t as fluid compared to the typical product from Disney or other American studios), but according to Laloux, “The technique raised the issue between movement and graphics at the expense of movement,” (from Laloux Sauvage) compared to domestic animation, which favors the reverse. The painstaking process involved thousands of detailed drawings on paper instead of animation cels. * During his four-year tenure, he taught an art class to the patients, and collaborated with them to create his first animated short film, Tic-tac (1957). Laloux isn’t interested in over-explaining things, which only makes the alien setting more believable. Although there is a cursory narration to guide the viewer, much remains an enigma. Unlike the majority of modern animated tales with too many answers and not enough questions, Fantastic Planet stimulates our imagination by letting many sequences play out without the benefit of explanation. The filmmakers value the audience’s ability to fill in the blanks. Fantastic Planet is a spectacular artifact from an age that was unafraid to take chances, representing a convergence of artistic integrity and a wealth of ideas. It’s a unique trip, worth taking again and again. I recall learning about Laloux back in college but I had never gotten around to watching this. Great review. I know I have a copy somewhere and I am going to watch this very soon. Thanks! 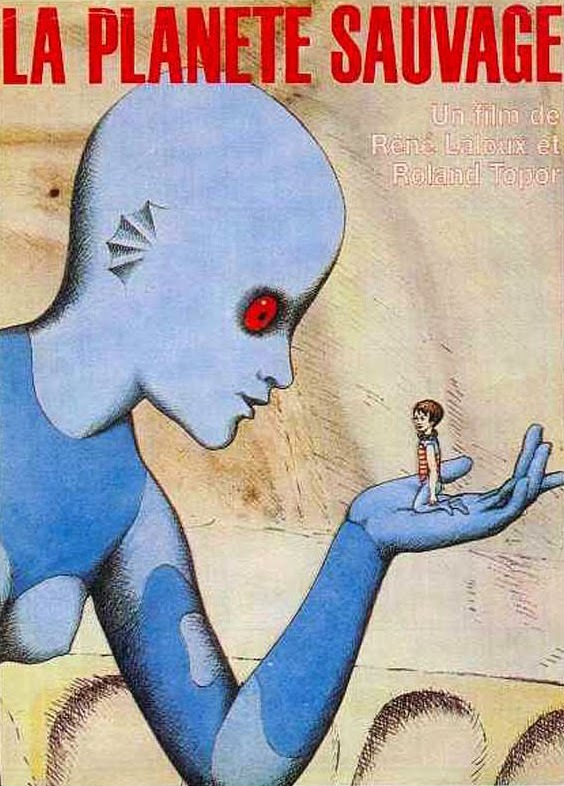 The last time I watched Fantastic Planet was probably a couple of decades ago. Watching it again (a couple times) was a revelation. Nothing else quite like it. Thanks for the kind words! This reminded me of something that might have come from Heavy Metal magazine, which was started a few years later in France. I was surprised by the film, and in a good way. Good comparison. It's a feast for the eyes and mind. It's too bad there aren't more filmmakers, or production companies for that matter, willing to take a chance on thoughtful animated science fiction.